If you're unhappy with your hair, it's time for a makeover. Drastic hair makeovers can be provide a major change that gives stunning results; however, they can also backfire and leave you with a look you are less than happy with. Be prepared by considering a few factors prior to your hair makeover, and then get ready for admiration over your bold hair move and gorgeous new look. There are numerous reasons why women and men may undergo a big change in hairstyle, cut, or hair color. Sometimes individuals are stuck in the same hair rut for years and are finally ready to break free. Others are always ready to make a major change with whatever the latest trendy hair style is. As the seasons change, many people consider a new look for their hair, and lifestyle changes can also call for a major cut or color change. Often women are seen getting a drastic hairstyle or color change after a relationship break-up. While there is nothing inherently wrong with getting a post-breakup hair makeover, since this is a time when emotions run high, take the time to consider the look carefully to make sure it fits you before jumping into the stylist's chair. Whatever the reason for making a major change with your hair, the new look can be amazing with a little forethought. Many women love the look of a certain celebrity or trends in hair style pictures and in magazines, but the look isn't always suited to their personal features or lifestyle. Caramel colored hair, for example, looks gorgeous on many warm-complected stars, but may be the wrong choice for someone with a cool skin undertones. A look that requires significant time to style each day or frequent maintenance might also be a poor choice for someone with a consistently overbooked schedule. Is the cut or hairstyle right for your face shape? Will the cut or style work with my hair type? Is the new hair color right for you? Will it work with your skin tone and eye color? Will the new look flatter your best facial features? Does the new look otherwise fit your lifestyle? Is a bob best for you? How much time will the style take to do on a daily basis? Will you be able to recreate it at home? How much maintenance will the new look require? Although planning well is the best way to make sure a drastic hair change gives you stunning locks, even the best-planned drastic hair makeovers can have mishaps that turn into bad hairstyles. If the worst happened and your hair turns out differently than expected, let the stylist know you are not pleased and ask how the situation can be remedied. In many cases, color can be corrected and styles can be altered to get closer to the look you desired. 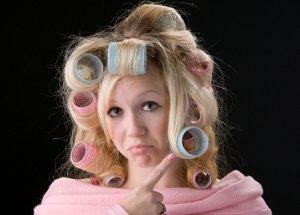 If your new look is shorter than you expected, or you aren't happy and little can be remedied, it can be disheartening. Try to stay positive, and remember that hair grows about half an inch per month. Be confident and turn a makeover mishap into an opportunity to get creative with funky styling options or unique hair accessories while it grows out, or wear vintage hats or scarves for a fun twist to make the most of your made-over style.